Beast Kingdom's Mini Egg Attack series is proud to present Edna Mode mini character statue from the classic animated picture The Incredibles! 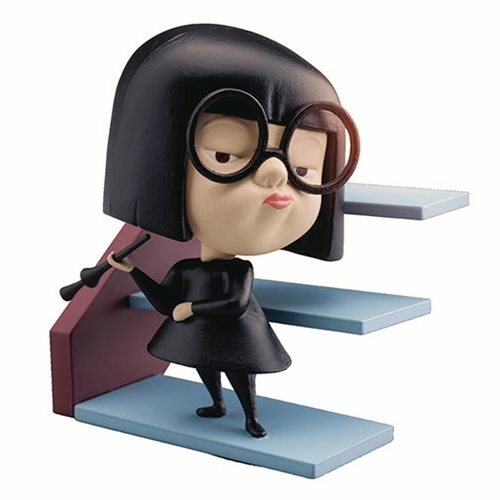 The Edna Mode statue shows off the essence and abilities of the character, with an unique base that has been designed based on settings from the movie. Not only are these bases perfect interact with and showcase the character, they can also be arranged into a small movie scene display (each sold separate). When the Parr family has successfully defeated the villains they have to thank the hero behind the scenes: the proud designer Edna Mode. The Disney The Incredibles MEA-005 Edna Mode Figure - Previews Exclusive features Edna Mode on a flight of stairs.